Christmas will be upon us soon. How many of you are looking forward to cooking a feast from scratch? Stressful, isn't it sometimes? But we still want to put good food on the table. I don't like to take shortcuts but have learned that sometimes, a little help is not necessarily a bad thing. Recently, I discovered "Mmmm! ", a purveyor of premium gourmet meats and ready-to-heat comfort food. Yes, I'll admit, I cringed at first thinking of ready-to-heat retort pouches but I'm glad I kept an open mind. They have a Christmas menu featuring hams, roasts, and ribs. Bone-in Gammon ham, roast wagyu rump, roast ribeye (grassfed beef), roast Iberico pork collar...it does sound good. I tried the Roast Turkey, courtesy of their food hamper. Even straight out of the vacuum sealed bag, the turkey smelt delicious. The turkey has already undergone sous vide cooking, so the roasting is just a simple final step that took less than an hour (not the 3-4 hours that you normally need). 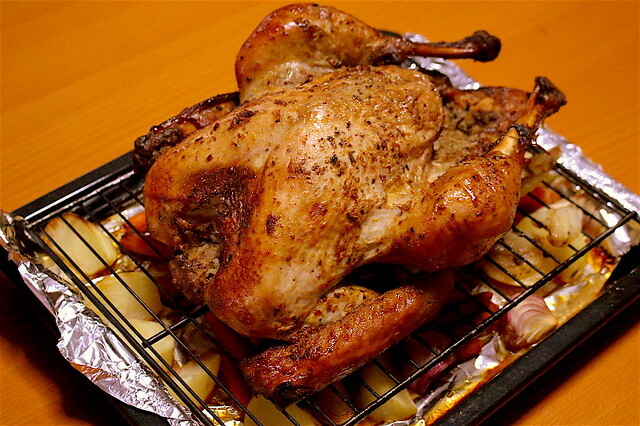 The bird is not very large (3.6kg to 4.5kg) but it came out really tender, with flavours well-infused within. My family loved it. My kids who normally don't like meat devoured this thing, asking for second and third helpings. I was quite surprised it all turned out so well. I haven't tried the other ready-to-heat items, but this is a promising start. The Christmas items must be pre-ordered at least three days in advance, and before 20 Dec. You can do so either at http://mmmm.com.sg, or in person at any one of their four stores located at Anchorpoint, Square 2 @ Novena, West Coast Plaza, and Changi City Point. With every $150 spent on the Christmas menu, you will receive a complimentary 1 kg packet of soup (either the Leek & Potato Soup, or the Zucchini Soup). All food items are cooked and chilled to maintain freshness, and come with a cooler bag and heating instructions. Many thanks to Mmmm! for the experience. First photo courtesy of Mmmm!